Up to 3,000 away fans are in the South Stand behind the goal, the views are impressive but leg room is tight. The facilities are good with big concourses and large screens showing the game. There’s a good choice of food, including hot dogs, burgers, chicken burger, pies and chips. Lager, bitter, cider and wine are also sold. Atmosphere in the stadium is reasonable, but the home fans often need prompting from the big screens to sing their signature song ‘Blue Moon’. Manchester is one of the best places in the country for a weekend away. If you want to stay over it’s best to book as early as possible. Printworks and Deansgate are great places to eat and drink, and you’ll have an enjoyable time on Canal Street. Pubs, clubs and restaurants are plentiful in these areas, and with Manchester being a major city there are loads of hotels to go around. With plenty of museums, art galleries and exhibitions, Manchester has plenty to offer anyone. Hotels near the stadium and/or nightlife are Double Tree by Hilton (M1 3DG), City Centre Piccadilly Premier Inn (M1 2HR), Jurys Inn (M1 5LE), Mercure Piccadilly (M1 4PH), Novotel Manchester Centre (M1 4LX), The Palace Hotel (M60 7HA) and Hilton Manchester Deansgate (M3 4LQ). Staying above a pub, can it get any better? A great pub I’ve stayed at a few times is the Burton Arms Hotel (Swan Street, M4 5JZ). It’s in the middle of all the action, a stroll from Deansgate and train station. The National Football Museum (M4 3BG) is in the middle of Manchester, next to Victoria Station. It is massive, has free entry and has the world’s greatest football collection of over 140,000 items. It’s open 10-5, Monday – Saturday. For some fresh air away from the pub, head to Heaton Park (M25 2SW). The park is huge with rowing boats, a children’s play area and an 18th century mansion, farm and beekeeping centre. There’s a tram museum and the day of the game, they run tram rides for £1 (children 50p). Michael McIntyre is at the Manchester Arena (M3 1AR) on the Thursday, Friday and Saturday (£25-£64). Grumpy Old Women with Jenny Eclair, Dillie Keane & Lizzie Roper is at The Lyric Theatre (M50 3AZ) on the Sunday night, (£26). The Palace Theatre (M1 6FT) has Miss Saigon on between 21st March – 12th May (£25-£64). There aren’t many pubs near the stadium, and those are for home fans. Away fans should avoid the Queen Victoria pub and Mary D’s as well as pubs on Ashton New Road, behind the away end. There’s a large area outside the ground for fans to eat and drink in a covered area, before and after games. However, the last couple of Swans games, security staff stopped away fans using the facilities. ‘The Stanley Sports Bar’ (M11 3QW) lets in away fans (£1 entry, kids for free) and a 10 minute walk to the stadium, Look at the large Asda (with a cafe) behind one side of the stadium with a McDonalds next door. Turn right, go down the main road; the pub is on the left. It has a large screen with sports, quick service and a mix of home and away fans. The Townley (M11 3QW) is a 5 minute walk to the stadium. The pub has a good atmosphere and as long as away fans arrive early without showing colours then it should be fine. 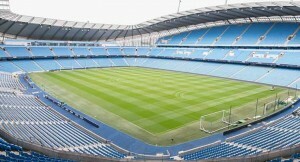 The Manchester City Supporters Club has its own social bar opposite the North Stand that sometimes allow away fans in. The city centre is recommended for a pint. Printworks, near Victoria station, has connecting tram service from Piccadilly. There are loads of pubs at the there with plenty of choice of food. The pubs around Piccadilly itself are OK. Deansgate or around the Town Hall, is good to aim for. It’s a 30 minute walk or £7 taxi to the stadium. Parking at the stadium is £10 per car. The East car park is best for away fans, but getting away after the game is a nightmare and can take an hour to exit. Streets around the ground are residents only for about a mile. Some other car parks charge around £5 per car, and getting out of them is much easier than the stadium car park. 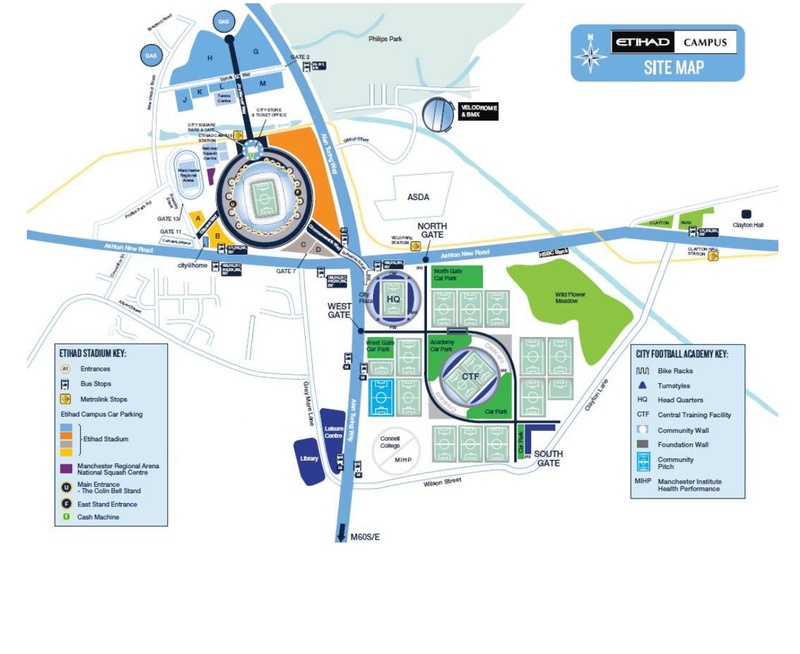 Here is a map of the Etihad Campus which provides a useful guide to the area around the stadium – click on the map image to see an enlarged version. The closest station is Ashburys, a 5 minute train from Piccadilly station, with the stadium a 15 minute walk. As you come out of the station turn left and after a while, you’ll come to the stadium on the left. It’s a 15 minute walk from Piccadilly station to the stadium or a £7 taxi ride. Use the exit to Fairfield Street (the taxi rank). At the street exit head toward the railway over bridge, under that, then left again under the railway (Travis Street into Adair Street), left at the end and right into Pollard Street (then as above). 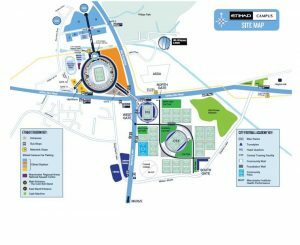 The Metrolink stop at the stadium called Etihad Campus makes it easier to park near the motorways and get a tram to the ground or city. Buses from Piccadilly Gardens to the stadium are £2 each way. Go down the main approach from the station, then along London Road to Piccadilly Gardens; buses leave from the right hand side of the square. 216 and 231 go from the city centre to the stadium. On the return, the buses leave from Ashton New Road across from the away end. Train to Manchester Piccadilly leave Swansea at 07:50, 08:52 and 09:48 getting in at 13:13, 14:16 and 15:15. The only train leaving Piccadilly is at 18:30 getting to Swansea at 23:59 so an overnight Sunday night stay is needed.